Sherwood, OR—February 11, 2019—Eagle Cap Software introduces its solution for the hobbyist flier, the pilot who enjoys the hundred-dollar hamburger but doesn’t like getting too techie. 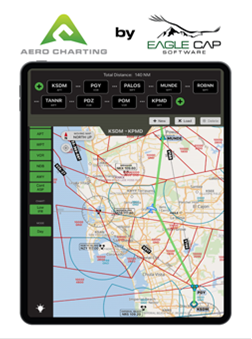 Aero Charting works on an iPad® and provides a moving map with vector aeronautical charts. It also allows custom route creation and integration with AOPA’s Internet Flight Planner. How is it free? Aero Charting is ad-supported, and for a limited time, users can permanently turn off the ads for just $9.99. Oh – and tell us what you think while your ideas are fresh in your mind. Just press the ‘lightbulb’ in the app to send us an email.